New Year New Dishcloth 2019!! This swap is for one handmade 100% cotton dishcloth. It can either be knit or crochet. This month's color choice is sender's choice. 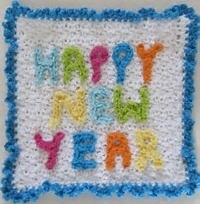 Let's start the new year with a beautiful new dishcloth!! Be creative. You will have one partner and will make one dish cloth. Do not wait for partners to be assigned. Choose any pattern, decide on your color and get started right away. This is not an expensive swap to complete. Please do not use designer cotton yarns for this project. These dishcloths are meant to be useful and durable. No swappers with less than a 4.9. It has been fun. Don’t know what others expect. It’s a freaking dishcloth. I’m out. I only use these cloths, not only for dishes, but for the shower! I’m excited. When does this have to be mailed? Almost finished with a square traditional one, but trying a circular pattern, so may send it when it’s completed, if I have time to finish it! Where do I find out about my partner and where to send it?